Our Flying Labs Framework starts out with what we call a “Scoping Phase”, which translates into an in-depth analysis of needs, opportunities and stakeholders in terms of drone applications and the data products they produce as well as an overview of the environment in the country in respect to drones. After a meeting and discussions at WSIS Forum 2018 in Geneva, we were invited by the Government of Benin, more specifically the Ministry of Digital Economy and Communication, to pursue a scoping analysis given Benin’s strategy on leveraging digital technologies to boost the country’s economy and make the country one of the digital leaders in Western Africa. 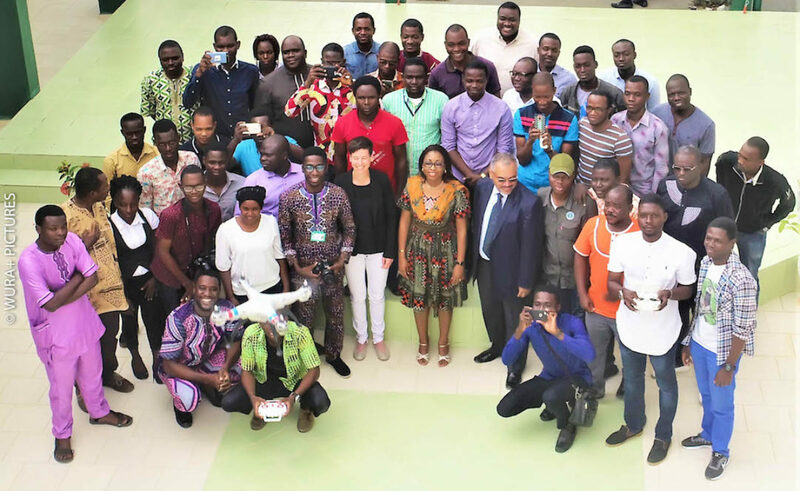 With the support of ADN (Agence de Dévelopement Numérique), Benin’s Agency for Digital Development, we organized a 3 day training from June 26 – 28 in Cotonou. The promotion and organization of this training was fully handled by ADN, which created huge interest with over 200 people signing up to be part of this training session. 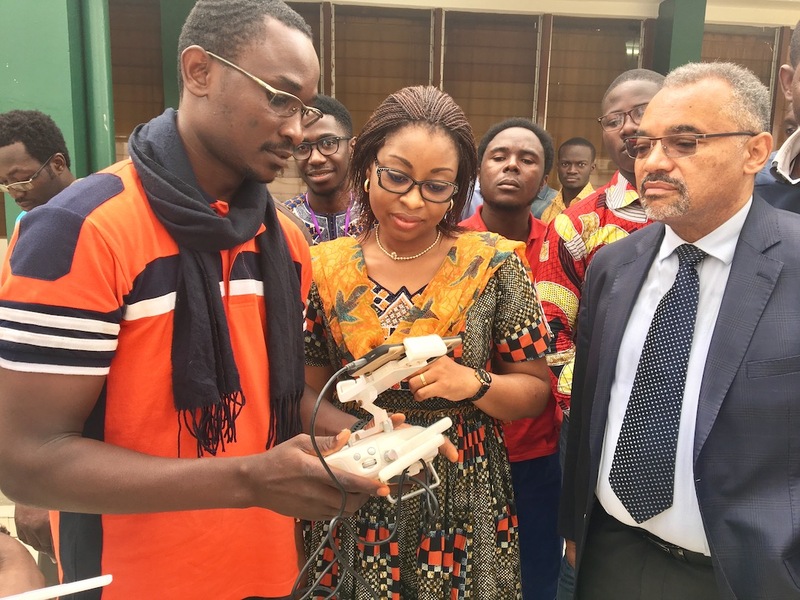 This impressive number of individuals interested in both using drones for social good in Benin and in creating business opportunities with drones is proof of the high interest in the country for the application of emerging technologies. A total of 50 applicants were selected and invited by ADN to attend the 3-day “Drones for Social Good” workshop, ranging from local NGOs such as OSM Bénin, Ingénieurs sans Frontières, Femme Rural, Solidar’IT, Fondation Joseph The Worker, Jeunes Volontaires pour l’Environnement, Africa Parks and CTA (to name just a few) to local entrepreneurs already using drones to students interested in leveraging new technologies as a career choice. The workshop was kicked-off with introductions from ADN’s CEO Serge Adjovi and a representative of the Ministry of Digital Economy and Communication, followed by a half-day theory part presented by WeRobotics Co-Founder Sonja Betschart, laying the foundations of basic knowledge on drone technology and use cases pursued in our Flying Labs across the Global South. During the next 2 days, all the participants contributed with their knowledge of needs in Benin that could be addressed by drones, discovering 68 opportunities and possible use cases for using drones in the country. On the last day, the opportunities were prioritized and the group decided on the 4 most promising ones to pursue in the next 12 months. We also addressed the most urgent challenges and elaborated first strategies on how to mitigate them. It’s always amazing to see the power of Co-Creation: bringing together a group of highly motivated and engaged people from various backgrounds to brainstorm on opportunities and possible constraints, thus creating a wealth of information which now builds a strong base to discuss and implement next steps in collaboration with ADN on how to localize drones in Benin in a focused way. We would like to sincerely thank ADN for having created this opportunity for WeRobotics. And we are very grateful to Mrs. Aurélie Adam Soule, Benin’s Minister of Digital Economy and Communication, for initiating this exchange. Special thanks go to all the participants who invested 3 days of their time and personal knowledge, sharing ideas in 5 half-day brainstorming sessions and actively participating in this important process on promoting the use of emerging technologies in their country. It has been an amazing week in Benin, seeing how initiatives of bringing a variety of stakeholder together can kick-start a real movement! Now it’s up to us all to turn this wealth of ideas into action and real impact.